I'm thrilled to release a new quilt pattern today - the Two Carat quilt. It's a clean geometric design that works equally well with solids and prints. The pattern includes directions for two sizes - baby (36" x 48") and throw (60" x 72") - along with templates and detailed cutting diagrams. Fabric is used efficiently and there are minimal leftovers. You will not have a pile of half-diamonds left over from this project! 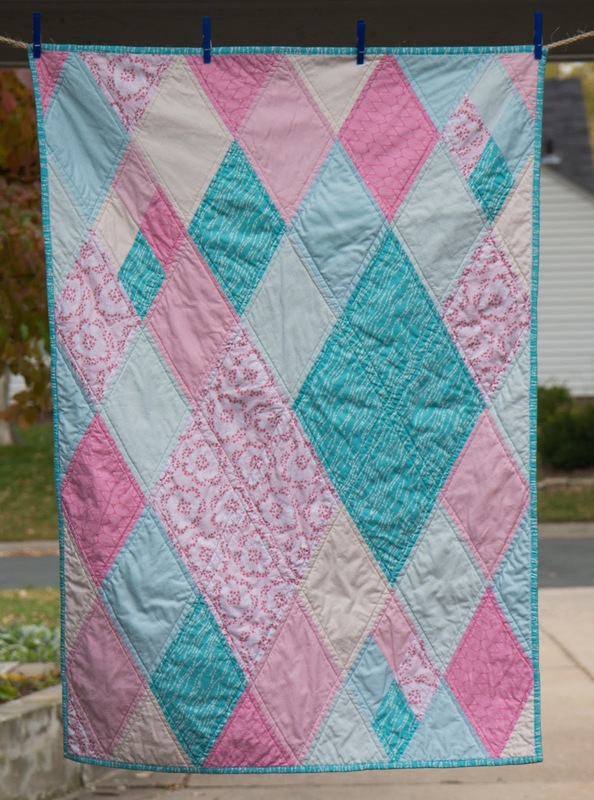 This is the baby size quilt in girly-girl pinks and blues. The quilt top requires (2) 1/2 yard cuts and (5) 1/4 yard cuts - so a total of only 2 1/4 yards. I finished the quilt with simple straight-line quilting 1/4" from the seams so it is extra crinkly and cuddly. I think this quilt would also look sharp with a baby's name or birth year free-motion quilted in one of the large diamonds. 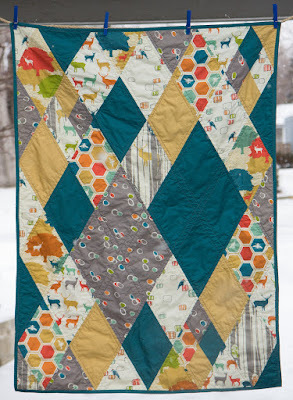 Here's a second baby quilt with Elk Grove fabrics by Jay-Cyn. This fabric is gorgeous and so, so soft - perfect for a baby quilt! I used 8 different prints for this variation: 2 half-yard cuts of solids and 6 fat quarters in different prints. The throw quilt uses the same size templates, just more pieces. 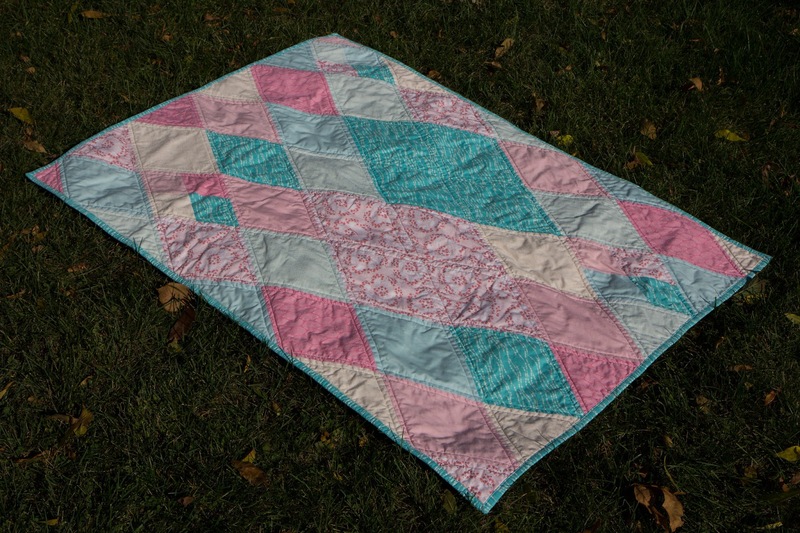 The layout for the throw quilt includes 2 sets of large diamonds. You'll invest more time in the cutting than you will in the piecing. Cutting diamonds and triangles using templates takes a little more time (I think) than cutting rectangles with a ruler, but piecing the quilt top goes quickly. The pattern includes tips for accuracy in cutting and piecing. This pattern is suitable for intermediate or adventurous advanced beginners. You can find the Two Carat quilt pattern on Etsy and Craftsy.